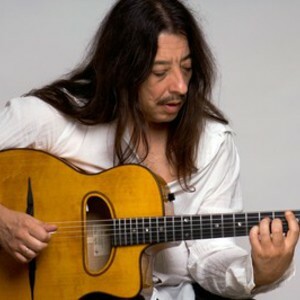 Harri Stojka is an Austrian Gypsy Swing Guitarist. He comes from a Roma Gypsy family that surrounded him with rhythm and harmony before he could even talk. When Harri Stojka was a kid, his dad gave him a plastic guitar he got at the fair. Only six years old, little Harri was visibly fascinated by it. So Harri's father didn't waste any time and bought him a real instrument that was appropriate for his age. From that point on, the classical or Spanish guitar became the focus of all of Harri's attention. The philosophy behind Stojka's music is pure fun and the joy of making music. Even though Harri Stojka has already made a number of recordings, live concerts remain the most important aspect of his artistic activities.